Superb interview between Marie Forleo and author Elizabeth Gilbert (Eat, Pray, Love). If you ever wanted to quit it all and throw yourself into that book project but were too afraid. Or you wanted to risk it all to start that business idea, but were worried you might lose it all. Elizabeth Gilbert saying it how it is and sounding like a breath of fresh air against all the ‘gurus’ who advocate “just follow your passion“. Why your ‘why’ is not enough. I sent out my daily Ponder earlier then decided to blog about it here. It reminded me of an interview between Frank Kern, John Reese and Tony Robbins. Frank asked how he could get more of his clients to implement the knowledge he taught them. Tony’s response was that the three of them were in a situation where they had to succeed. They were more afraid of the consequences of NOT creating the change and taking the action required than of taking it and potentially failing. And this was missing in most people. John Reese then says something along the lines of most people haven’t got to the point in their lives where they must make a change, so they sit back and procrastinate a bit longer. Now I’ve thought about this video a lot over the last few years and recognised that I had a ‘must‘ moment about 11 years ago (see My Story on this blog for more details) but since my life got immeasurably better I slowly mislaid my ‘must‘. Now I’m on a mission to locate it again because I don’t want to get to the position where my back’s against the wall once more. I don’t want my must to be to move away from something so much, as I want it to go towards something; more freedom, more choices, more time in my life. I think I’ve been thinking that I needed that urgency in order to motivate me again, but I don’t. What I need now is a vision. What I ‘must‘ have in my life. That’s what I’m going to identify as soon as possible, then I’ll use that as my rocket fuel. Let’s not be the boiling frog. Allowing ourselves to become more and more uncomfortable as the temperature rises. 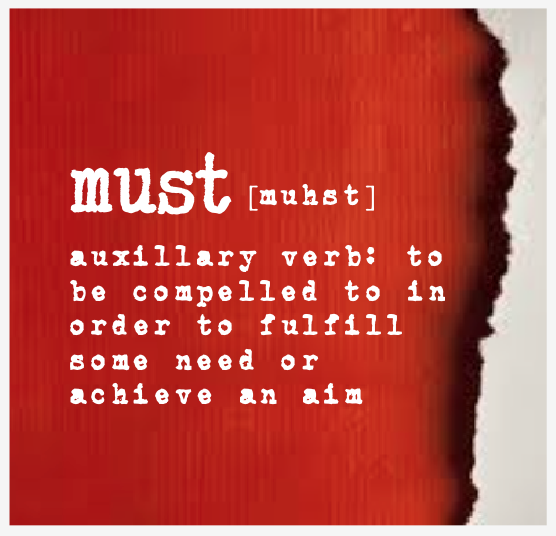 Let’s discover our ‘musts‘ and allow them to propel us in to the future we desire.